Which Type of Foam Eartip Is Right for You? The industry-standard in advanced engineering for in-ear comfort, stay-in-ear grip, and superior audio experiences has partnered with Razer, the world’s leading lifestyle brand for gamers, to include the ultimate earphone upgrade in-box for Razer’s new Hammerhead USB-C ANC earphone. 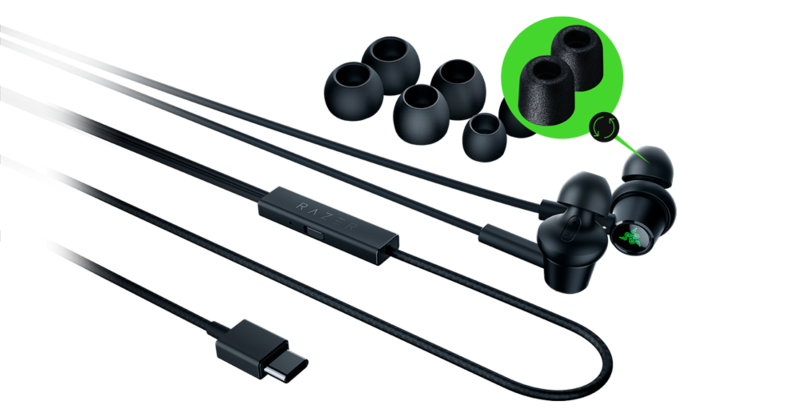 OAKDALE, MN, December 5, 2018 – To ensure maximum long-term wear comfort for their users, Razer has chosen to partner with Comply™ Foam Tips for their new Hammerhead USB-C ANC earphone. Comply Isolation Tx-500 foam tips help enhance the Hammerhead, the latest earphone from Razer that delivers the active noise cancellation capabilities of larger headsets without the bulk. Featuring new dual driver technology that combines the bass from a dynamic driver and high frequency details from a balanced armature driver for full range sound. Also included is a digital-to-analog converter (DAC) that ensures the sound is clear and uncompressed. This, combined with the Comply tip’s signature all-day, in-ear comfort and the custom-engineered noise cancelling foam to optimize the audio experience, means the end user is in for an extraordinary overall gaming and listening experience. Due to our unique viscoelastic technology, Comply™ foam tips create a seal that adjusts to any changes in the shape of your ear canal caused by movement, sweat, or temperature shifts – blocking out exterior noise and environmental distractions at all times. Users can focus on audio and enjoy it to the fullest without having to raise the volume to damaging levels to compensate for distracting outside noises. The Hammerhead’s Comply™ Isolation Tx-500 tips are exceptionally soft, extremely comfortable, and they securely conform to the exact dimensions of your ear. Best of all, the incredibly comfortable softness of the tips greatly reduces earphone irritation and fatigue, allowing the user to play, watch, or listen longer. Comply™ foam tips are made from memory foam that expands to fill the unique shape of your ear, creating a dynamic fit that drastically increases in-ear fit and reduces slippage. Comply tips offer up to 50% better grip than standard silicone, ensuring that your Razer earphones will stay put regardless of whether you’re gaming, commuting, watching movies, or rocking out. Never worry about losing your earphones again. Comply™ foam tips feature an adaptable perfect seal that funnels pure, rich sound directly into the ear, delivering exceptional sound quality. Prepare to be immersed with full surround sound for your gaming experience. Comply™ foam tips come equipped with our WaxGuard™ protection technology. This acoustically transparent filter protects the inner components of your earphones from corrosion and loss of sound quality by blocking off dirt, dust and debris. Hearing Components Inc., manufacturer of Comply™ products, was founded in 1990 by Dr. Robert Oliveira to identify and create unique, innovative foam solutions that enhance sound and protect hearing. The U.S. National Institute of Health has awarded several grants to Hearing Components to study the ear and mechanics of hearing, with the intent to improve and protect hearing. Comply technology is used in consumer electronic products, military, law enforcement and industrial communication devices, and audiology devices. Comply Foam is an R&D-centric brand focusing on dramatically improving the physical connection between a person’s audio device and their ears. With more than 25 years of experience understanding the ear canal, advanced knowledge in material science, and comfort-focused acoustic expertise, Hearing Components continues perfecting the ultimate personal audio experience.